Added by Indo American News on September 1, 2016. HOUSTON: The words of his students, some parents and fellow artists were genuinely heartfelt, with so much emotion and warmth coming from almost a dozen of them that there were very scant metaphors or expressions of affection, respect and admiration left to be uttered. Whatever gap there was in their rapture was filled by their deferential body language and tender gazes fixed upon their Guru who sat smilingly on the sofa besides the Indian Consul General Anupam Ray as they paid tribute to him. When he learnt that Pandit Suman Ghosh lived, performed and taught in Houston, Consul General Ray wanted to hold a reception for him at his house in Memorial to honor Ghosh for his service to classical Indian music and for training a generation of young Indian Americans at his Center for Indian Classical Music of Houston. In the short five months that Ray has been in the Bayou City, he has shown his deep appreciation for the Indian arts and literature by his involvement with the community in programs – like the International Yoga Day and with Samskriti in the Incredible India – that highlight them. Ray has shown that he is not a captive of the mundane, but an intellectual drawn to an unconventional perspective of life. As the evening’s emcee Sunanda Vashisht explained, Jasraj paid the tribute after an incident with a shlok which Jasraj had composed long ago while both men toured extensively in Mumbai, but had forgotten about and lost in the ensuing years. The composition came back to Jasraj’s mind one day but he could not recall it and so he contacted Ghosh. Fearing that the composition would disappear into oblivion, Ghosh immediately set out to retrieve and recreate this shlok called Nandkumarashtakam and then presented it in front of his astonished Guru. Pandit Ghosh began training at the age of 7 under the guidance of his mother Monika Ghosh. Later he trained under maestros like Pandit Shrikant Bakre, Padmabhushan Pandit Jnan Prakash Ghosh, and finally, the living legend of Indian music, Padma-vibhushan Pandit Jasraj and started offering concerts by age16. 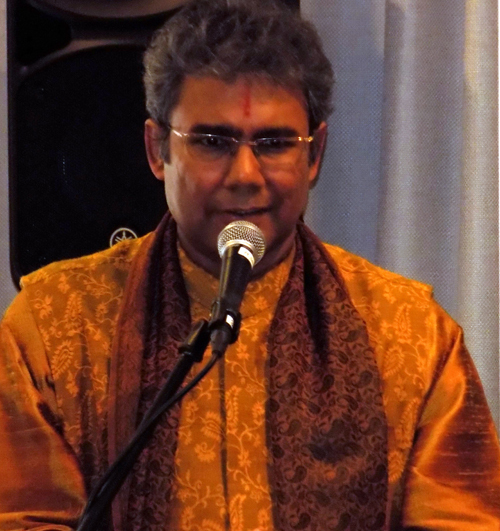 Ghosh taught at Jasraj’s School of Music in Tampa, Florida before moving to Houston and then started his own school – The Center for Indian Classical Music of Houston – in Sugar Land in 2008. As a testament to his personal involvement in their musical journey, nine teenage students of his – Aamani, Amiya, Bhavi, Deepshikha, Devangshu, Jaytirth, Meera, Prasun and Saarang – sang two shloks while Ghosh himself played the harmonium in accompaniment. Sunanda Vashisht opened up the program with a detailed description of Ghosh’s impact on the musical scene in Houston and internationally, describing him as “a performer par excellence, path finding guru, research scholar, writer and a visionary”. 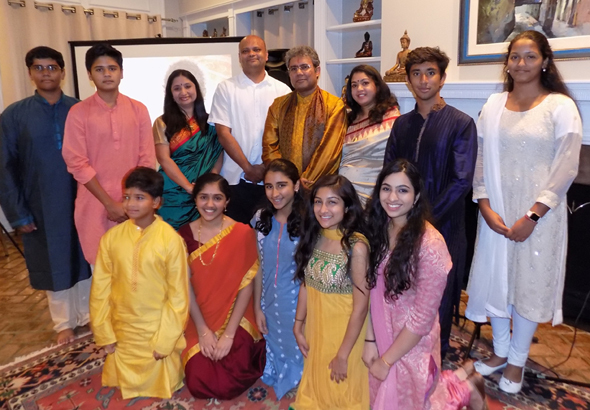 Consul General Ray gave a few introductory remarks after which others in the audience spoke in admiration of Ghosh’s work, intense humility and dedication first to his students and the annual Saadhana Unmesh concert that they present their skills at. Pat Jasper, the Executive Director of the Houston Arts Alliance’s Folklife and Traditional Arts program, spoke of her admiration for the pursuit of musical excellence in the Hindustani style of schooling – the Gurukul – from a tender age which has produced the artist Suman Ghosh. Suresh Raghavan, a parent of one of the students explained how Ghosh was a guru with high energy, dedication and encouragement imparted education and even helped shape worldviews in as close to the traditional Indian style of schooling called Gurukul. Another parent, Sangita Vennelakanti, spoke of Ghosh as a path finding Guru who can transform lives. 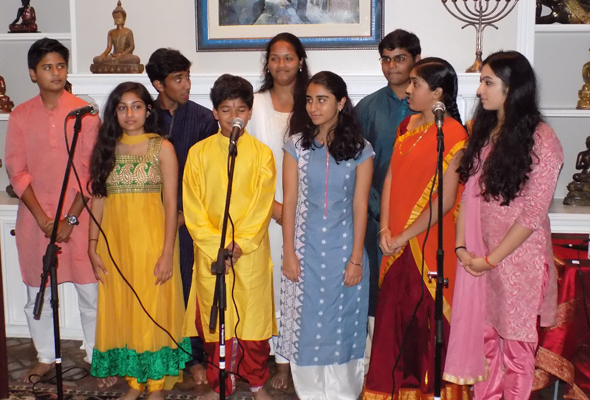 Sonal Bhuchar, a former Fort Bend ISD Board Trustee and appointed by Texas Governor Abbott to the One Star Foundation Commission spoke about how Ghosh had made it simple for others to understand and enjoy classical Indian music. Archna Tripathi laughed that she was Ghosh’s oldest student and how he was available to all his disciples at any time of day and also lauded his wife Shashsikala who kept everything together. Shashikala expanded on her role as Guruma and said that her husband was on a musical missionary. She spoke of his dedication first to his students and then to any personal glory, turning down offers to perform in his desire to serve as a Guru first. Overcome with all the adulation, Pandit Ghosh cited his own Guru Pandit Jasraj’s life as an example of someone who chose to be faithful to his quest to be his personal best as a classical vocalist and turned down offers of help by his father-in-law, the filmmaker V. Shantaram, to be in a singer for Bollywood movies. “I came from this tradition and took up classical music in that spirit,” he said, adding his most memorable moment was when he sang Vandematram at the Indian Parliament in 1997. Ghosh complimented Consul General Ray, noting that his name “Anupam” meant “unparalleled” which he truly was. Ray acknowledged the compliment and also said that next year, the Consulate’s Republic Day program would be a concert of all young Indians from Houston. The evening concluded with dinner and a recital by Ghosh to the appreciative audience.